Most of the work in the Fragments Series pertains to the passage of time – time evidenced in one form or another. The photographs that comprise this piece (six in all) were made over the period of 20 minutes when the full moon was setting and the sun was rising. 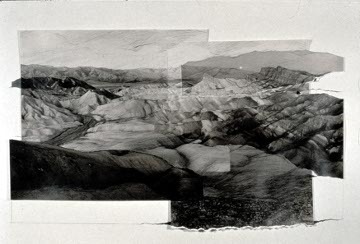 From the elevation provided by Zabriskie Point one is given the chance to experience the protraction of the brief series of moments when the moon is just ready to drop behind the western horizon while at the same time the sun is peaking above the eastern. The shadows created by one seem to intersect with those being created by the other. It is only an instant played out against geologic stage set that also reveals the passage of time.